The Way of the Cross on Good Friday, 2003.
together with words of peace and forgiveness. as Bishop of Rome and Pastor of the Universal Church. to the summit of Calvary. who presides over the Church in charity. a warm and restless night of the first full moon of spring. We gather here in the Lord's name. He is present in our midst, just as he promised (cf. Mt 18:20). And with us too is the Blessed Virgin Mary. Daughter of Adam, Our Sister, Queen of Peace. to bring them comfort and to renew their hope of peace. to your service and to the liberation of mankind. But the crowd shouted all the more, "Crucify him". he delivered him to be crucified. Pilate's verdict was pronounced under pressure from the priests and the crowd. The sentence of death by crucifixion was meant to calm their fury and meet their clamorous demand: "Crucify him! Crucify him!" (Mk 15:13-14). The Roman praetor thought he could dissociate himself from the sentence, washing his hands of it, just as he had already distanced himself from Christ's words identifying his Kingdom with the truth, and with witness to the truth (Jn 18:38). In both instances Pilate was trying to preserve his own independence, to remain somehow "uninvolved". So it may have seemed to him, on the surface. But the Cross to which Jesus of Nazareth was condemned (Jn 19:16), like the truth he told about his Kingdom (Jn 18:36-37), had to strike deep into the Roman praetor's soul. All this was, and is, a single reality, in the face of which one cannot remain uninvolved, on the sidelines. When Jesus, the Son of God, was questioned about his Kingdom and, because of this, was judged guilty by men and condemned to death, his final testimony began: he was about to demonstrate that "God so loved the world..." (cf. Jn 3:16). We have this testimony before us, and we realize that we are not allowed to wash our hands of it. faithful witness to the love of the Father. even unto death on a Cross. The execution, the implementation of the sentence, is beginning. Christ, condemned to death, must be burdened with the Cross just like the two other men who have received the same punishment: "he was numbered with the transgressors" (Is 53:12). Christ draws near to the Cross, his body atrociously bruised and lacerated, blood running down his face from his head crowned with thorns. Ecce Homo! (Jn 19:5). In him we see all the truth foretold by the Prophets about the Son of man, the truth proclaimed by Isaiah about the servant of Yahweh: "He was wounded for our transgressions... and by his stripes we are healed" (Is 53:5). In him we see also the amazing consequence of what man has done to his God. Pilate says: "Ecce Homo" (Jn 19:5): "Look what you have done to this man!" But there seems to be another voice speaking as well, a voice that seems to be saying: "Look what you have done, in this man, to your God!" It is very moving to hear this voice from centuries ago, as it blends with the voice coming to us from what we know in faith. Ecce Homo! Jesus "who is called the Messiah" (Mt 27:17) takes the Cross upon his shoulders (Jn 19:17). The execution has begun. you reveal to man the mystery of himself. by your stripes we have been healed. Jesus falls under the weight of the Cross. He falls to the ground. He does not resort to his superhuman powers, he does not resort to the power of the angels. "Do you think that I cannot appeal to my Father, and he will at once send me more than twelve legions of angels?" (Mt 26:53). He does not ask for that. Having accepted the cup from the Father's hands (Mk 14:36) he is resolved to drink it to the end. This is as he wills it. And so he has no thoughts of any superhuman force, although such force is at his disposal. Those who saw him when he showed his power over human infirmities, crippling diseases and even death itself, may well, in their grief, have wondered: "What now?" "Is he repudiating all that?" In a few days the disciples on the road to Emmaus would say: "We had hoped" (cf. Lk 24:21). "If you are the Son of God...." (Mt 27:40), the members of the Sanhedrin were to fling at him. And the crowd would yell: "He saved others but he cannot save himself" (Mk 15:31: Mt 27:42). He accepts these provocations, which seem to undermine the whole meaning of his mission, his teaching, his miracles. He accepts them all, for he is determined not to combat them. To be insulted is what he wills. To stagger and fall under the weight of Cross is what he wills. He wills it all. To the end, down to the bitter end, he is faithful to what he had said: "Not my will, but yours be done" (cf. Mk 14:36, etc.). God will bring forth the salvation of humanity from Christ's falling beneath the weight of the Cross. you bear the sin of the world. you share in our human weakness. The Mother. Mary meets her Son along the way of the Cross. His Cross becomes her Cross, his humiliation is her humiliation, the public scorn is on her shoulders. This is the way things are. So it must seem to the people around her, and this is how her own heart reacts: "And a sword will pierce through your soul also" (Lk 2:35). The words spoken when Jesus was forty days old are now fulfilled. They are now completely fulfilled. And so, pierced by that invisible sword, Mary sets out towards her Son's Calvary, her own Calvary. Christian devotion represents her with this sword penetrating her heart, in paintings and sculpture. Mother of sorrows! "You who shared his suffering! ", say the faithful, who know in their hearts that the mystery of this suffering can be expressed in no other way. Although this pain is hers, striking deep in her maternal heart, the full truth of this suffering can be expressed only in terms of a shared suffering - 'com-passion'. That word is part of the mystery; it expresses in some way her unity with the suffering of her Son. with you we call upon your Son Jesus. Simon of Cyrene helps Jesus to carry the Cross. Simon of Cyrene, called upon to carry the Cross (cf. Mk 15:21; Lk 23:26), doubtless had no wish to do so. He was forced to. He walked beside Christ, bearing the same burden. When the condemned man's shoulders became too weak, he lent him his. He was very close to Jesus, closer than Mary, closer than John who - though he too was a man - was not called upon to help. They called on him, Simon of Cyrene, the father of Alexander and Rufus, as we learn from the Gospel of Mark (Mk 15:21). They summoned him, they compelled him. How long did he continue to resent being forced into this? How long did he continue to walk beside this condemned man, all the while making it clear that he had nothing in common with him, nothing to do with his crime, nothing to do with his punishment? How long did he go on like that, torn within himself, a barrier of indifference standing between him and the Man who was suffering? "I was naked, I was thirsty, I was in prison" (cf. Mt 25:35-36), I carried the Cross. "Did you carry it with me?" "Did you really carry it with me to the very end?" We do not know. Saint Mark simply records the names of the Cyrenian's sons, and tradition has it that they were members of the Christian community close to Saint Peter (cf. Rom 16:13). neighbour to the poor, the sick, the lowly. every act of love towards the exile, the outcast, the stranger. Tradition has bequeathed us Veronica. Perhaps she is a counterpart to the story of the Cyrenian. As a woman, she could not physically carry the Cross or even be called upon to do so, yet in fact she did carry the Cross with Jesus: she carried it in the only way possible to her at the moment and in obedience to the dictates of her heart: she wiped his Face. Tradition has it that an imprint of Christ's features remained on the cloth she used. This detail seems fairly easy to explain: since the cloth was covered with blood and sweat, it would preserve traces and outlines. Yet this detail can have a different meaning if it is considered in the light of Christ's words about the last days. Many will then ask: "Lord, when did we ever do these things for you?". And Jesus will reply: "Truly I say to you, as you did it to one of the least of these my brethren, you did it to me" (cf. Mt 25:37-40). In fact the Saviour leaves his imprint on every single act of charity, as he did on Veronica's cloth. disfigured by pain, resplendent with God's glory. imprinted on every act of love. and made me cower in ashes. "I am a worm, and no man, scorned by men, and despised by the people" (Ps 22:6). The prophetic words of the Psalmist are wholly fulfilled in these steep, narrow alleys of Jerusalem in the final hours before the Passover. We know that those hours before the feast are unnerving, the streets teeming with people. This is the context in which the words of the Psalmist are being fulfilled, even though nobody gives this a thought. Certainly it passes unnoticed by those who jeer, those for whom this Jesus of Nazareth, as he now falls for the second time, is a laughing-stock. And he wills all this, he wills the fulfilment of the prophecy. And so he falls, exhausted by all the effort. He falls in accordance with the will of the Father, a will expressed in the words of the Prophet. He falls in accordance with his own will: "How then should the Scriptures be fulfilled, that it must be so?" (Mt 26:54). "I am a worm, and no man" (Ps 22:6). Not even an Ecce homo here (Jn 19:5), but something much less, much worse. A worm creeps along the ground, whereas man, like a king among creatures, walks above it. A worm will gnaw even at wood: like a worm, remorse for sin gnaws at man's conscience. Remorse for the second fall. in order to ennoble all creatures. crushed by men, yet raised up by God. Here is a call to repentance, true repentance, and sorrow at the reality of the evil that has been committed. Jesus says to the daughters of Jerusalem who are weeping at the sight of him: "Do not weep for me, but weep for yourselves and for your children" (Lk 23:28). One cannot merely scrape away at the surface of evil; one has to get down to its roots, its causes, the inner truth of conscience. This is precisely what Jesus means to say as he carries his Cross: he always "knew what was in man" (cf. Jn 2:25) and he continues to know it. That is why he must always be for us the closest onlooker, the one who sees all our actions and is aware of all the verdicts which our consciences pass on them. Perhaps he even makes us understand that these verdicts have to be carefully thought out, reasonable and objective (for he says: "Do not weep"), while at the same time bound up with all that this reality contains: he warns us of this because he is the one who carries the Cross. the Truth leading us to life. whose presence eases our pain in the hour of trial. "He humbled himself and became obedient unto death, even death on a Cross" (Phil 2:8). Every station along this Way is a milestone of that obedience and self-emptying. We appreciate the scale of that self-emptying when we begin to ponder the words of the Prophet : "The Lord has laid on him the iniquity of us all... All we like sheep have gone astray; we have turned everyone to his own way; and the Lord has laid on him the iniquity of us all" (Is 53:6). Who is it who has fallen? Who is Jesus Christ? "Though he was in the form of God, he did not count equality with God a thing to be grasped, but emptied himself, taking the form of a servant, being born in the likeness of men. And being found in human form he humbled himself and became obedient unto death, even death on a Cross" (Phil 2:6-8). in order to turn our cries of pain into a song of joy. in order to ennoble all creation. to decide what each should take. As Jesus is stripped of his clothes at Golgotha (cf. Mk 15:24, etc. ), our thoughts turn once more to his Mother. They go back in time to the first days of this body which now, even before the crucifixion, is covered with wounds (cf. Is 52:14). The mystery of the Incarnation: the Son of God takes his body from the Virgin's womb (cf. Mt 1:23; Lk 1:26-38). The Son of God speaks to the Father in the words of the Psalmist: "Sacrifice and offering you desired not; but a body you have prepared for me" (Ps 40:7; Heb 10:5). A man's body is the expression of his soul. Christ's body is the expression of his love for the Father: "Then I said, 'Lo, I have come to do your will, O God" (Ps 40:7; Heb 10:7). "I always do what is pleasing to him " (Jn 8:29). With every wound, every spasm of pain, every wrenched muscle, every trickle of blood, with all the exhaustion in its arms, all the bruises and lacerations on its back and shoulders, this stripped body is carrying out the will of both Father and Son. It carries out the Father's will when it is stripped naked and subjected to torture, when it takes unto itself the immeasurable pain of a humanity profaned. The human body is profaned in any number of ways. At this Station we must think of the Mother of Christ, because in her womb, in her eyes and in her arms the body of the Son of God was most fully adored. still violated in your living members. still divided in your members. "They have pierced my hands and feet, I can count all my bones" (Ps 22:16-17). "I can count...": how prophetic were these words! And yet we know that this body is a ransom. The whole of this body, its hands, its feet, its every bone, is a priceless ransom. The Whole Man is in a state of utmost tension: his bones, his muscles, his nerves, his every organ and every cell, is stretched and strained to breaking-point. "I, when I am lifted up from the earth, will draw all men to myself" (Jn 12:32). These words express the full reality of the crucifixion. And part of this reality is the terrible tension penetrating Christ's hands, feet and every bone: driving its way into the entire body which, nailed like a mere thing to the beams of the Cross, is about to be utterly annihilated in the convulsive agony of death. And the whole of the world which Jesus wills to draw to himself enters into the reality of the Cross. The world is dependent on the gravitational pull of this body, which inertia now causes to sink lower and lower. The Passion of Christ Crucified lies precisely in this gravitational pull. "You are from below, I am from above" (Jn 8:23). 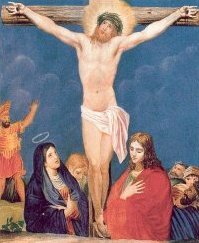 From the Cross he says: "Father, forgive them, for they know not what they do" (Lk 23:34). made by love a sign of reconciliation and peace. you have ransomed man, the world, the universe. Here we have the greatest, the most sublime work of the Son in union with the Father. Yes: in union, in the most perfect union possible, precisely at the moment when he cries: "Eloi, Eloi lama sabachthani" - "My God, my God, why have you forsaken me?" (Mk 15:34; Mt 27:46). This work finds expression in the verticality of his body stretched against the perpendicular beam of the Cross and in the horizontality of his arms stretched along the transverse beam. To gaze upon those arms one would think that in the effort they expend they embrace all humanity and all the world. Here is the man. Here is God himself. "In him we live and move and have our being" (Acts 17:28). In him: in those arms outstretched along the transverse beam of the Cross. and took the body of Jesus down from the Cross. When the body of Jesus is taken down from the Cross and laid in his Mother's arms, in our mind's eye we glimpse again the moment when Mary accepted the message brought by the angel Gabriel: "And behold you will conceive in your womb and bear a son, and you shall call his name Jesus; the Lord God will give him the throne of his father David, and of his kingdom there will be no end" (Lk 1:31-33). Mary had replied simply: "Let it be to me according to your word" (Lk 1:38), as though even then she wanted to give expression to what she now experiences. In the mystery of the Redemption, grace - the gift of God himself - is interwoven with a "price" paid by the human heart. In this mystery we are enriched by a gift from on high (Jas 1:17) and at the same time "bought" by the ransom paid by the Son of God (cf. 1 Cor 6:20; 7:23; Acts 20:28). And Mary, who more than anyone was enriched by gifts, pays all the more. With her heart. Inseparable from this mystery is the extraordinary promise spoken of by Simeon during the Presentation of Jesus in the Temple: "And a sword will pierce through your heart, so that the thoughts of many hearts may be revealed" (Lk 2:35). This promise has also been fulfilled. How many human hearts bleed for the heart of this Mother who has paid so dearly! Once again Jesus lies in her arms, as he did in the stable in Bethlehem (cf. Lk 2:16), during the flight into Egypt (cf. Mt 2:14) and at Nazareth (cf. Lk 2:39-40). Pietà. and filled with hope we call upon him. and laid him in a tomb which had been hewn out of the rock. From the moment when man, as a result of sin, was driven away from the Tree of Life (cf. Gen 3:23-24), the earth became a burial ground. With as many burial places as there are men. A great planet of tombs. Close to Calvary there was a tomb belonging to Joseph of Arimathea (cf. Mt 27:60). In it, with Joseph's consent, the body of Jesus was placed after being taken down from the Cross (cf. Mk 15:42-46 ff.). They laid it there in haste, so that the burial might be completed before the feast of Passover (cf. Jn 19:31), which began at sunset. In one of the countless tombs scattered all over the continents of this planet of ours the Son of God, the man Jesus Christ, conquered death with death. O mors! Ero mors tua! (First Antiphon of Morning Prayer for Holy Saturday). The Tree of Life from which man was banished as a result of sin is set before mankind anew in the body of Christ. "If anyone eats of this bread, he will live for ever, and the bread which I shall give for the life of the word is my flesh" (Jn 6:51). Though our planet is constantly being filled with fresh tombs, though the cemetery in which man, who comes from dust and returns to dust (cf. Gen 3:19), is always growing, nonetheless all who gaze upon the tomb of Jesus Christ live in the hope of the Resurrection. in the new tomb you destroy death and grant life. is the new Tree of Life. At the end of his address, the Holy Father imparts the Apostolic Blessing.